Happy Monday! 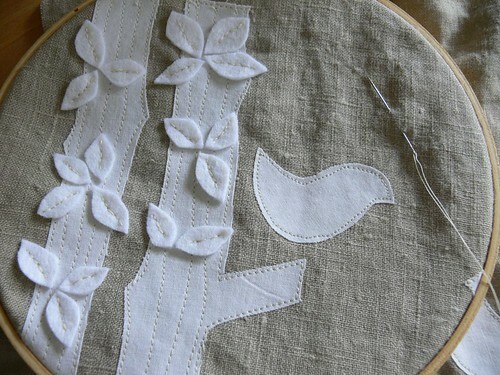 We're so excited to welcome sponsor friends, old and new, to Stumbles & Stitches! These are some great small businesses that we are happy to support. We hope you'll give them a click and go check out their offerings. 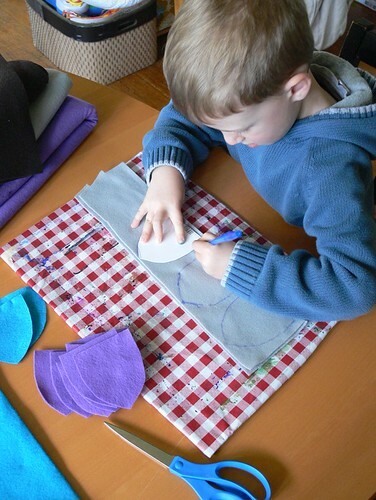 After all, it's time to stock up on supplies for holiday sewing and crafting! 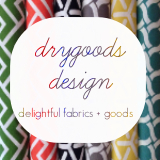 Drygoods Design Online offers a fabulous selection of modern fabrics and handmade items, with free domestic shipping and low international rates. Owner Keli is a Seattle mom of two. You can find her on Facebook, Twitter and Pinterest where she loves to plan projects with fabrics from various collections. During October, she is honoring Breast Cancer Awareness with 30% off all pink fabrics. 10% of proceeds from purchases made with code PINK30 will be donated to Susan G. Komen foundation. 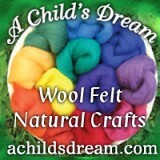 A Child's Dream Come True is a fantastic online source for wool felt, natural crafts and more. 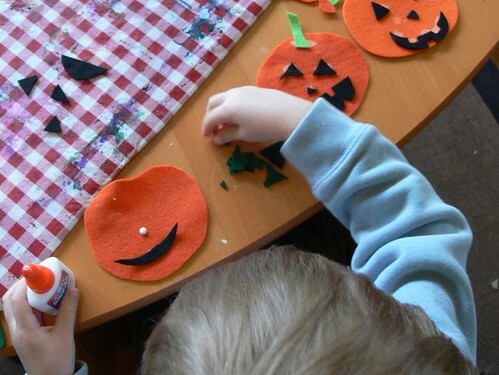 We love their 70+ colors of Holland Wool Felt for all kinds of projects, it's perfect for making Christmas ornaments! A Child's Dream just received a new shipment of beautiful wood puzzle toys from Russia, they can be found here. 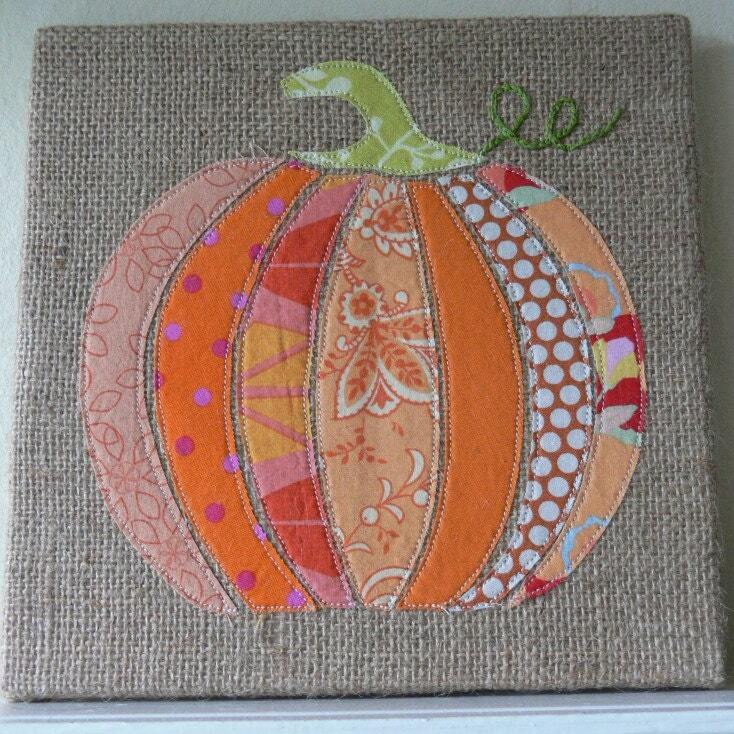 Owner Debbie is inviting Stumbles & Stitches readers to use the code STST to save $5 on your order of $30 or more. Good through October 23. 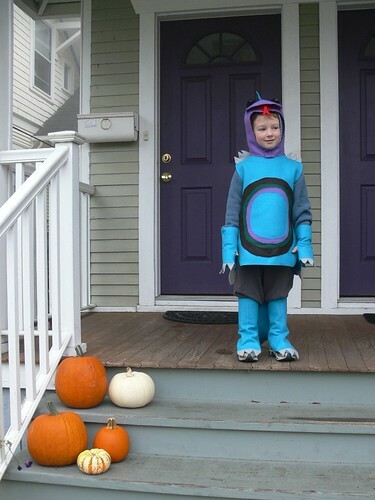 You can find A Child's Dream Come True on Facebook here. 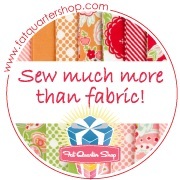 Fat Quarter Shop has all the fabric you'd ever need to make a quilt and more! Owner Kimberly is proud of their excellent customer service and super fast shipping. Visit their website for exclusive quilt clubs, quilt kits and a huge selection of fat quarter bundles. 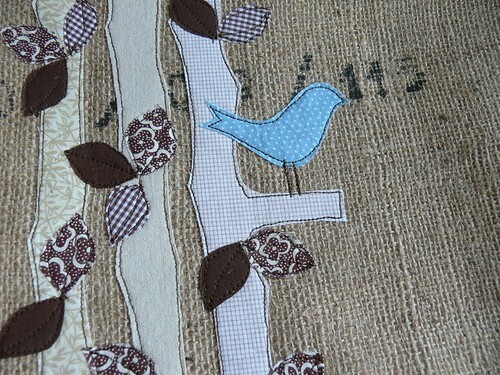 They've recently unveiled their new It’s Sew Emma pattern company (website coming soon here). 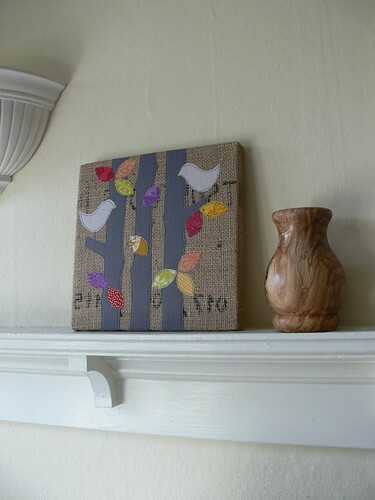 You can find Fat Quarter Shop on Facebook, Twitter and on Kimberly's blog The Jolly Jabber. 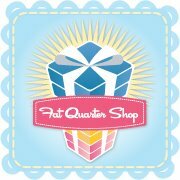 Stay tuned for a Fat Quarter Shop giveaway coming soon! Fashionable Fabrics specializes in novelty and unique fashion fabrics. 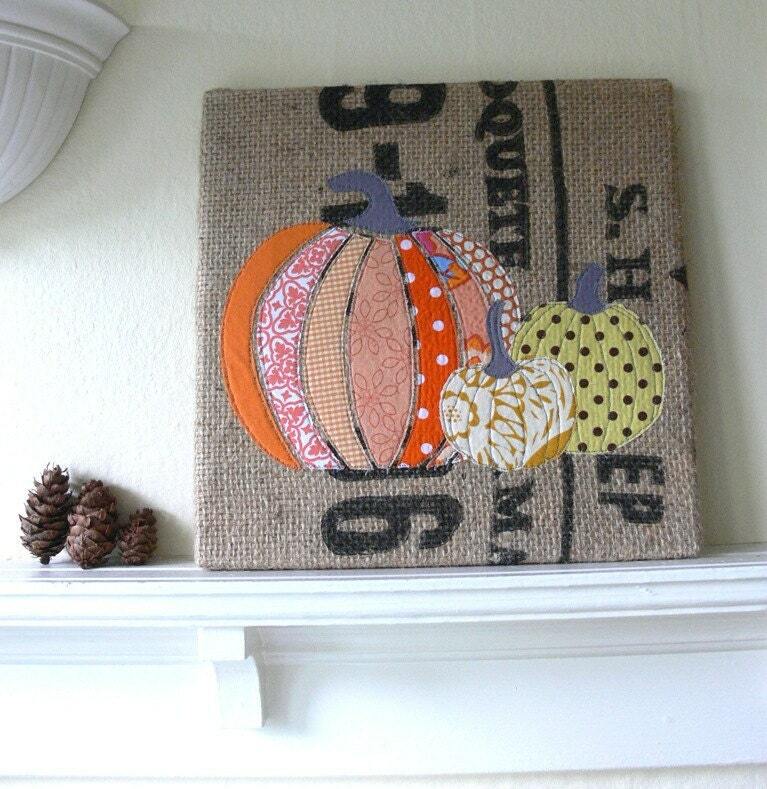 They have a great selection of Alexander Henry prints among many other designers. 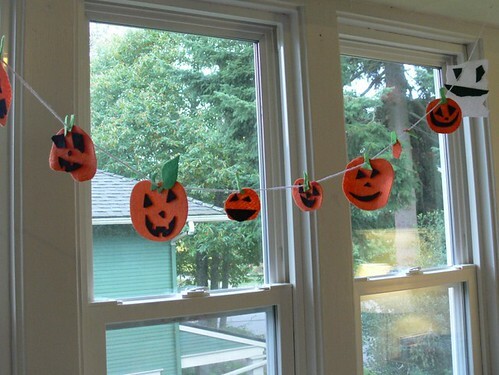 Check out their Halloween fabrics (Ghastlies!) and Christmas fabrics (Christmas Candy!). 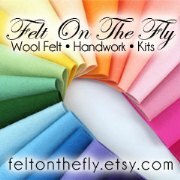 Fashionable Fabrics offers a $4.95 flat shipping rate on all US orders. You can find them on Facebook and Twitter. We are grateful to these lovely businesses for sponsoring us and helping us continue the work we do on this little blog. For more information about advertising on Stumbles & Stitches, please visit our Sponsorship page. Me: Do you know what kind of lizard you want to be? What color? 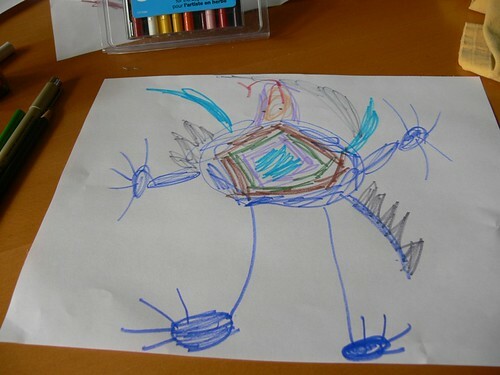 Ben: I want to be a rainbow lizard, it's got all kinds of colors. And it eats salmon berries, not bugs. And it can see in the dark. And it has claws that look like metal so that bugs don't eat him. Me: Oookay. Sounds good. Do you know what you want it to look like? Ben: Yeah. 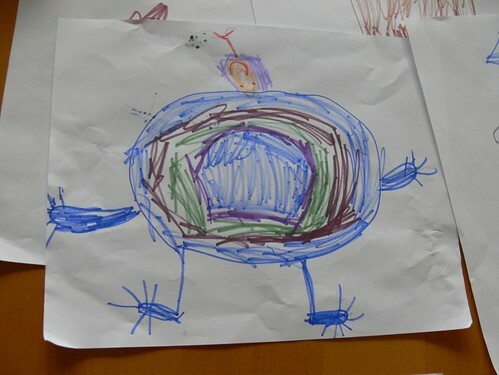 I'll draw you my dee-zign.